Some Bologna highlights below. You have not had lasagna until you’ve had it in Bologna! Travel to magical Bologna and Emilia Romagna to enjoy the best of this region steeped in food and drink gloriousness. From traditional Tortelloni and ragu, to the region’s exceptional Reggiano Parmigiano cheeses, balsamics and wines, we’ll imbibe in the best of them all. 6 nights in Bologna at a gorgeous, centrally-located hotel (the main cover image on this page is taken from one of the room balconies), from which we will experience excellent dining, a market visit with a cooking classes, exploring the historical highlights and porticoes. We’ll venture to a beautiful castle in the countryside for two nights, from where we will enjoy a farm stay and stops everywhere Astrid wants you to experience. Stroll through the historical center before we meet for an aperitivo at one of the oldest locales in the city. Walk through the vibrant arcades and lengthy porticoes to build an appetite for the first fabulous dinner of the week. We’ll meet our chef for the day, who will guide us to the local market market to buy ingredients for our cooking class. You’ll have a chance to learn recipes first-hand that have been made in Bolognese homes for centuries like ragu Bolognese. You’ll shape regional handmade pasta: tortellini, cappelletti, and agnolotti and crescentine. Then you’ll enjoy the fruits of our group’s labors for lunch. Later you’ll enjoy an experienced guide walking us through this beautiful city. Discover the ancient history of the citiy’s hidden canals, the Etruscan architecture of the ten gates that define the city, and the silk industry of the Medieval Ages. Today, you’re free to explore the town. Visit the oldest library in Europe (under which lies ancient Roman ruins), Walk through endless architectural porticoes en route to a hilltop sanctuary for a view of the valley, or climb one of the oldest Medieval towers built in 1109, or perhaps a bitters tasting of amari made locally since the 19th century that is made with more than 40 herbs. Wander and stop to eat outdoors. We’ll meet for spectacular dinner where we can share the day’s adventures. Pack your bag for a few nights in the countryside by private transport, drive north with a stop in Reggio Emilia for a regional piadina for lunch. Visit artisan “King of Cheeses” tasting, DOP Parmigiano reggiano. Later in the day, prosciutto tasting in the afternoon. Dinner in Parma is on your own. We will meet after your dinner to drive to check in at an incredible hilltop castle built in the 10th century, which will be our base for the next three nights. SEE IMAGES BELOW. You’ll want this experience. Today, we will head out to a 14th century farm, but first, en route, lunch on your own in the beautiful fortressed city of Piacenza, on the cusp of Lombardy. 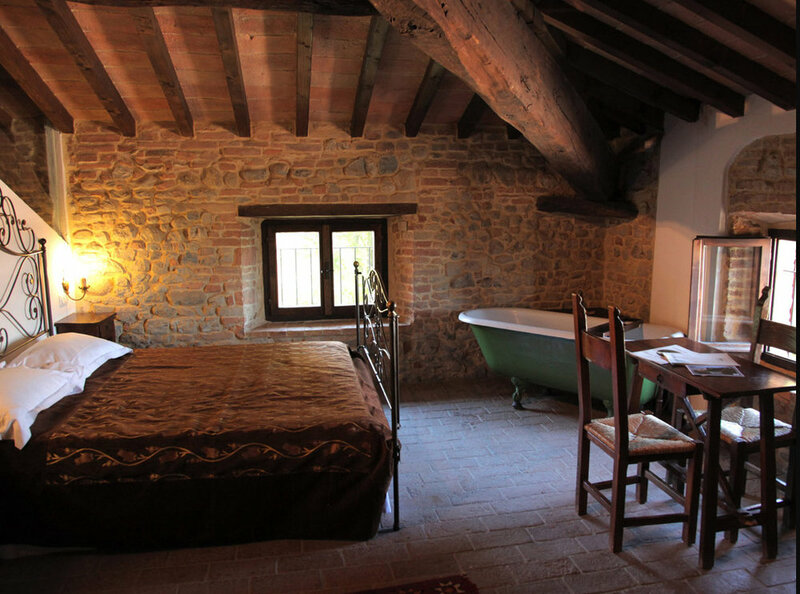 Then it’s a leg to the farm, where we will be visiting a salamuria and then stay for a Michelin-star dinner to follow. Have you ever had butternut squash ravioli? We’ll head back to our castle after dinner, about 40 minutes. You will have seen some beautiful and diverse Italian country on this day, with different perspectives of the Po River all day. Enjoy the wonderful breakfast at the castle. It’s a day of relaxation, so you may choose to book a treatment in the spa. There are trails for walking , bikes, or you may book a round of golf, or even ride a horse. We’ll meet for an aperitivo on the terrace, and then dinner in the castle’s restaurant. 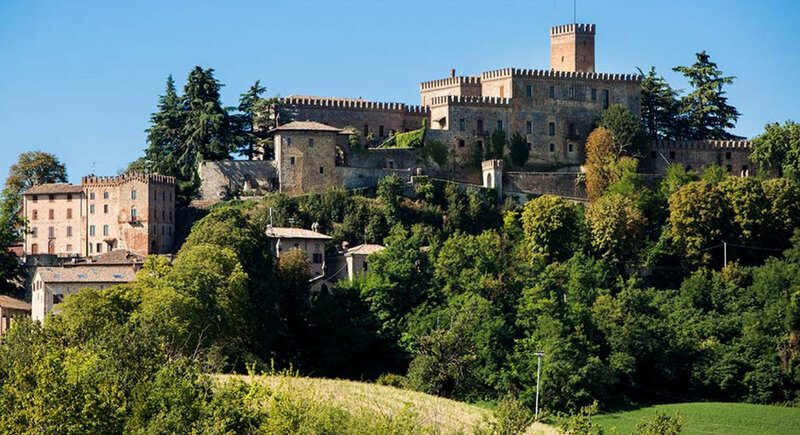 We will check out of the castle and then depart en route to Bologna, where we will stop in Modena with some free time to explore Modena’s historic center, and options for either balsamic vinegar tasting or a venture through the famous Ferrari museum. Then after a couple of hours, we proceed to a winery established in 1860 to sample ancient varietals of this micro climate to taste Fortana, the grape of gold and Lambrusco Grasparossa DOC, with some charcuterie to enjoy the wine. Then we will return to Bologna and check in to your hotel, where you may find your own adventure! Get your last minute shopping done on your last day in Bologna, and visit the spots you wanted to see. We’ll have a beautiful farewell lunch to celebrate our adventure. Check out, and off to home or more adventures! Below, some images from our trip to Tuscany in 2017. Just to give you an idea of how much fun we have. Who knows fine dining better than the people who publish the world's 50 best restaurants list every year? they've assisted us in choosing and booking some of delicious experiences you'll have on this trip. Astrid Ensign: Our co-host - you must read this. 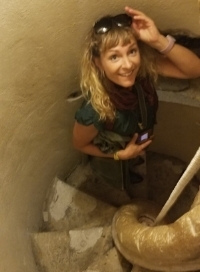 While the PFA format for our trips usually involves a chef or producer, in Italy our experienced tour planner and on-the-ground guide is Astrid Ensign of Taste of Italy. Astrid grew up in – of all places, rural Montana – in a town that had a one-room school house. Four of the other eight students in her school were her siblings. As a fifth grader, Astrid got her hands on a National Geographic Magazine, fell in love with an article about Italy, and announced to her parents that her dream was to go to Italy. “Sure, Astrid. If you can earn the money, then let’s talk about it…” By the age of 15, she’d saved enough money to gain the attention of her parents as being serious, and the arrangements were made. So, not yet speaking any Italian, this small-town girl was Italy-bound on a plane for the first time in her life, for an almost year-long exchange program in Italy. astrid's first picture in italy, in venice on her third day there with her host mom. That was 25 years ago, and since then, she continued her studies in Italy, living and flourishing in Florence and elsewhere, Astrid was taken with the food and wine of Italy. So she set about getting to know chefs, wine and food producers. Astrid bases herself in Portland, and has been treating Portlanders to her findings for years, either through her work with travel companies or her own. Now, Portland Food Adventures has teamed up with Astrid’s Taste of Italy brand to curate everything we do in Italy. This will be our second trip with Astrid, and we can’t harp enough about how delightful her guidance and presence is. You are welcome to ask our previous guests. 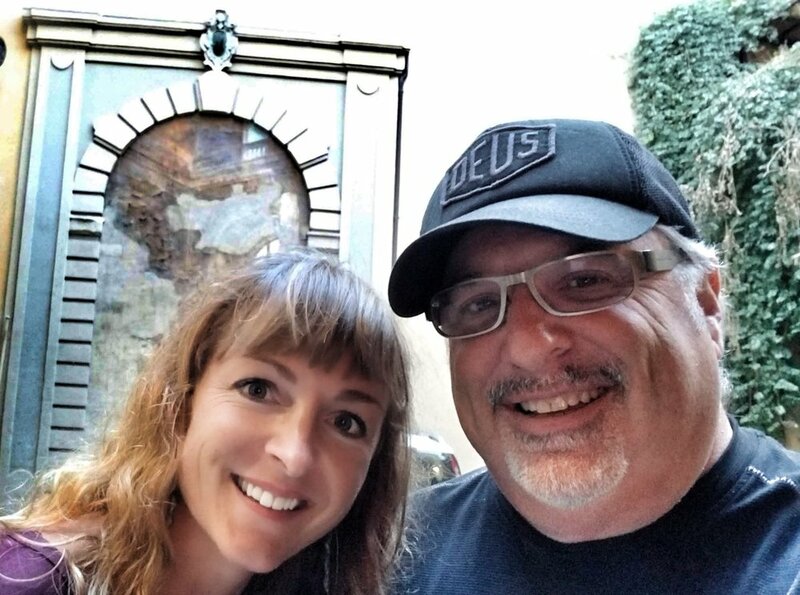 You’ll see her pictured in some of the images below, as Astrid and PFA’s Chris Angelus (who is your co- host) took a few days before their Tuscan trip in 2017 to experience first-hand much of what Astrid had in store for this 2018 Sicilian adventure, as well as some new discoveries. We are pleased to offer your chance to experience the best of Eastern Sicily. BLACK FRIDAY SAVINGS OF $500 TO FIRST FOUR SPOTS IF BOOKED BY NOV 28. 50% of cost of trip due upon reservation. Then, balance of full cost of trip due by 5/31/19. All payments made after 12/31/18 are non-refundable. Payments other than initial $500 deposit (fees added) may be made by check only. YOU MAY MAKE A $500 PER PERSON DEPOSIT HERE. While our trips feature smaller groups for maximum enjoyment and interaction, this trip is subject to a low minimum number of guests. Please do not buy airfare until we inform you that the minimum has been met. WHAT IS/ISN’T INCLUDED: This trip includes accommodations in a beautiful, 4-Star hotel, hotel taxes, all transfers (or reimbursement) to and from BLQ airport on 10/4 and 10/12, all dining experiences cited in itinerary, a welcome lunch in Portland to meet your fellow travelers ahead of time, and transportation to our excursions away from the city. They do NOT include airfare or trip insurance (which we strongly recommend and can be purchased online), mini-bar, incidentals, gratuities (generally for our drivers and some restaurants) and personal expenses. Lastly, our groups are really fun, and we want to make sure we keep them that way. So, if you’re a flexible, open traveler who appreciates the opportunity to sit back and let us do the planning and the legwork while you eat and drink really well, this trip is for you. If you need to be in complete control of your schedule, and need to know what’s happening months in advance on Friday at 3pm during the trip, this may not be the best way for you to travel. Our guests who put this in our hands report the times of their lives!! We can help you with excursions before, during and after as well.